Hamilton, 275 km west of Melbourne, is the administrative centre for the Shire of Southern Grampians in western Victoria. Surrounded by grazing pastures producing the finest of merino wools, and self styled ‘Wool capital of the world’ the town is at the junction of the Henty and Glenelg Highways, and on the railway line to Portland. It is situated in a loop of a creek known as the Grange Burn, a place first visited by Europeans when Major Thomas Mitchell’s exploring party transited the future town site – along Collins or Lonsdale Streets – on 12 September 1836. Shortly after Mitchell’s visit, the surrounding area was rapidly taken up by squatters leasing large areas of land for the ‘depasturing’ of sheep. Within the lands of the Aboriginal Kuurn Koapan Noot tribe, the site was first identified as suitable for a township by the surveyor Lt C.J. Tyers in 1839 during his travels to the Portland Bay district to re-define the boundary between New South Wales and South Australia. Hamilton’s administrative centre role began in 1841 following the appointment of the first police magistrate and the construction of a court house at the Grange, as Hamilton was then known. The appointment was justified by the need to control lethal warfare between squatters and local Aborigines, resolve boundary disputes between squatters and to recapture convicts escaping to South Australia through the corridor between the Grampians and the rough terrain to the south. The present court house and police station occupy the original sites. Surveyed and finally gazetted as a town site named Hamilton in May 1851, town land auctions followed six months later. As the surrounding area developed, the town became the administrative centre for the Dundas Road District – separated from the Portland Road District in August 1857 – and at the end of 1859, was gazetted as a municipality. Proclamation as a town came during 1928, and as a city on 22 November 1949. The origin of the name Hamilton is unclear, and is discussed by Garden (see further reading) at pages 37-38. The town’s first newspaper was published in 1861, in time to cover the notorious land sales conducted in the early to mid-1860s. The land sales increased the regional population due to the detachment of some land from the major squatting runs and the establishment of mixed farming. A hospital was built in 1864, and by the early 1870s, three major schools: the Hamilton and District College, the Alexandra College for Ladies, and a new State school. 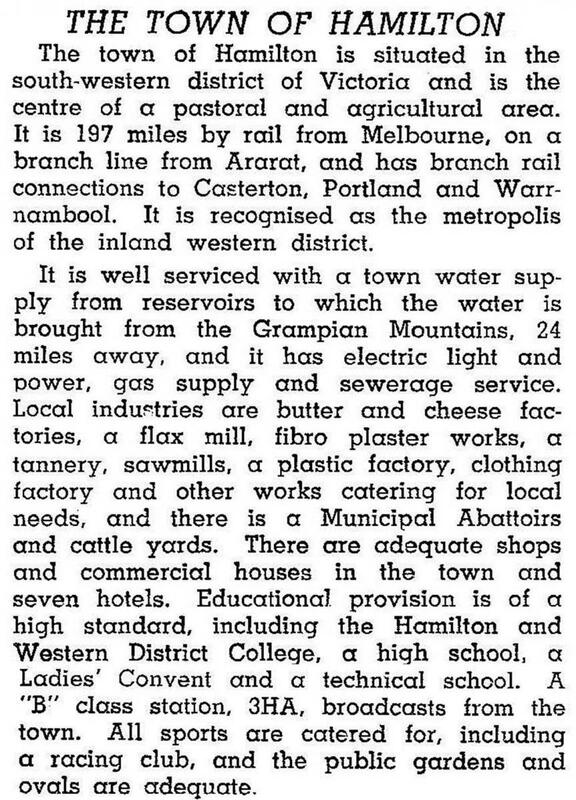 Hamilton was connected by rail to Melbourne via Ararat in 1877, and to Portland in the following year. A further network of subsidiary lines was built connecting Coleraine and Horsham, and Warrnambool, but only the Ararat – Hamilton – Portland route remains in use, for freight only. Mainly dependent on the grazing industry, saleyards and an abattoir are obvious commercial enterprises, but a timber mill and machine tool firm made some variety to the town’s enterprises. The water supply is piped to local reservoirs from the south-western ranges of the Grampians. Regional agricultural development was boosted by various nineteenth century selection Acts, closer settlement and soldier settlement schemes following World Wars I and II, and the gradual break up of major squatting runs. Diversifications have included dairying, flax growing, grain crops – principally barley and oats – and more recently ultra fine wool and an emerging silviculture industry. However the town also was the base from which Reginald M. Ansett began to build his transport empire in 1931, first operating a road service to Ballarat, and in 1936, his air service from Hamilton to Melbourne. In the early 1950s a pastoral and veterinary research institute was established, based in Hamilton and on a nearby farm property. In 1999 it was transferred to a site south-east of Hamilton on Mount Napier Road. Hamilton is host to multiple religious denominations. A major feature of the town is the collection of fine churches, St Andrews (Uniting), Anglican (Christ church), Roman Catholic (St Mary’s), and other denominations represented as Lutherans and Baptists and the Salvation Army. Victorian Heritage registered structures in and around the town include the TB Chalet in Tyers Street (1849-50), the Bevington organ in the Baptist church (pre-1850), Hamilton gas holder (1877), Hamilton club building in Thompson Street (1904) and Murdal homestead to the west of the town (1838). 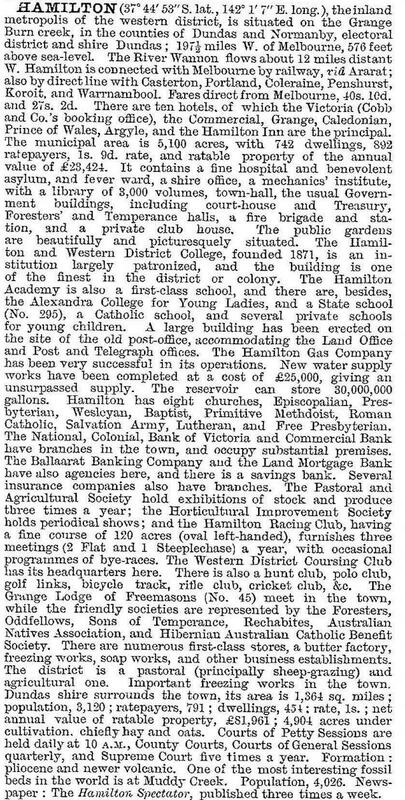 Other features including the botanical gardens, laid out by Guilfoyle in 1882, Monivae mansion (1878), a trotting and race track, several golf courses, the artificial Hamilton Lake, large enough for dinghy sailing and water skiing, created by damming the Grange Burn, an excellent art gallery, and an adequate shopping centre, supported by hospital, banking, legal and commercial services. There are historical, pastoral and Ansett museums, and a pastoral and agricultural society showground. Hamilton is an education centre with two residential schools, Hamilton College managed by the Uniting church and Monivae College associated with the Catholic primary school at St Mary’s. Lutheran primary and secondary schools reflect the long presence of that religious community in the area. At adult level, the Hamilton Rural Learning Institute and the Hamilton Education Centre Limited serve the region. State schools and long standing private schools serve the surrounding area. There is a good range of motel, hotel accommodation, and the town’s proximity to notable natural features: the Grampians ranges, ancient volcanic peaks and lava flows, significant waterfalls and visually attractive countryside make it an excellent tourist centre. Passenger travel to Melbourne is available via coach alternatively through Ararat for train connection or direct via Ballarat. Charter services are available at the airport. On 23 September 1994, Hamilton city was united with most of Dundas and Mount Rouse shires and part of Heywood shire to form the Southern Grampians shire. Hamilton is the shire’s administrative centre. Local opposition arose when the shire announced that it was rebranding the town from the 'wool capital of the world' to 'Hamilton – one place, many possibilities' to highlight the town's 'business, education, service and employment prospects'. Community members staged a 'Wooly West Fest' decorating the town with woollen items in 2014, many based on Mem Fox and Judy Horacek's popular children's classic Where is the green sheep?